Your vehicle’s Tires must be checked according to Periodic Service Schedule. Always checked tire pressure when tires are cool not after driving them when they are warmed up. Use impact sockets to remove your wheels with a wrench. Normal sockets are not designed to take impact subjected by power tools. When inflating tires always be careful and respect the pressure. Overinflation can occur very quickly due to the small volume. Over pressurisation your tires can separate the tire from the rim, cause a sudden explosion resulting in injury to yourself and others. Your expect driving terrain dictates the level of air pressure you fill your tires. On hard surfaces you should have slightly her tire pressure. Conversely on very soft surfaces a lower pressure tire should be used as it increases the width of your tire contacting the surface preventing cutting in. Never exceed the pressure identified on the tires sidewall. 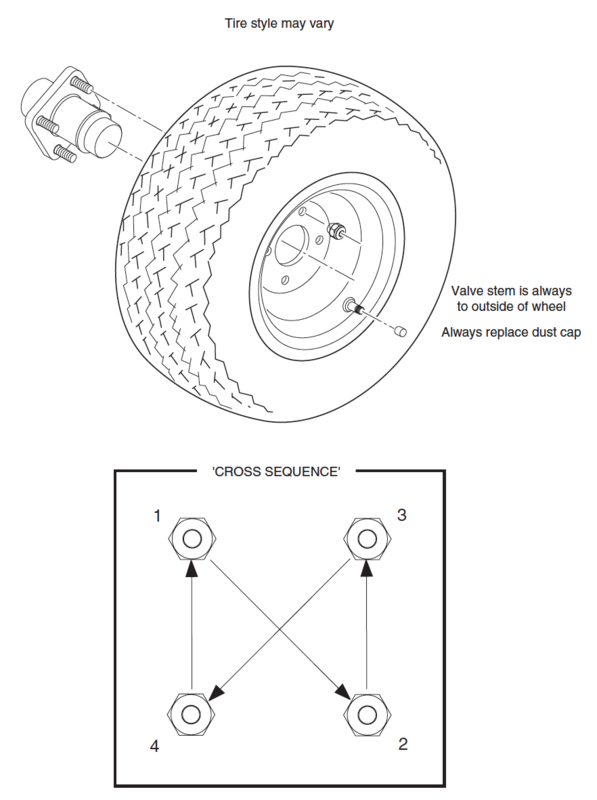 Always ensure all four tires have the same air pressure and install the dust cap back on the tire after use. Each vehicle is provided with low pressure tubeless tires within a single piece rim. The most cost effective way to repair a flat tire is to use a commercial tire plug. If you find your tire flat, inflate the tire and dunk the tire in a water container. where you see air bubbles leaking out from the tire, make it with chalk. Fit a commercial tire plug to repair the puncture. Ensure the valve stem is always on the outside of the wheel. Fit the wheel to the vehicles hub and finger tighten the nuts. Using a ratchet torque wrench tighten the nuts to 50-85ft. lbs. (70-115Nm) following a cross sequence pattern.